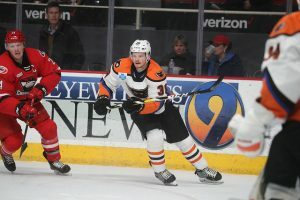 Charlotte, N.C. – The Lehigh Valley Phantoms were topped in a 5-1 decision at the first-place Charlotte Checkers on Tuesday night and thus missed out on an opportunity to gain ground on the idle teams occupying the last two playoff spots in the Atlantic Division. 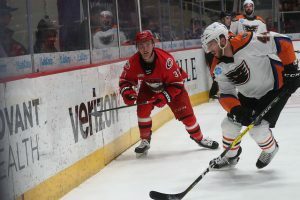 Both third-place Hershey and fourth-place Providence were not in action but the Phantoms couldn’t close the deficit and remain six points back of the last playoff position with six games remaining. Lehigh Valley (34-29-7) is now 2-2-0 on its five-game road-trip heading into a rematch at Charlotte on Wednesday night. The Phantoms also took just their second regulation loss in the last seven games. Nicolas Aube-Kubel (15th) sniped in the third period on an assist from center Byron Froese who extended his point streak to five consecutive games scoring three goals and four assists in that span. Charlotte (47-16-8) received a pair of goals from hard-shooting Aleksi Saarela (26th, 27th) and three assists from Andrew Poturalski to pace the attack. The game also marked the pro debut of forward Matt Strome who signed an Amateur Try Out contract earlier in the week. The 20-year-old rookie is the younger brother of NHL players Ryan Strome and Dylan Strome. He was a fourth-round selection of the Philadelphia Flyers in the 2017 draft. Alex Lyon started for the Phantoms and allowed four goals in two periods of work. Mike McKenna entered in relief and surrendered one goal in the third frame. The Checkers raced out to a fast start with a 19-3 shots advantage in the first period that included a pair of goals. Tomas Jurco benefited from an almost-blind backhander from below the goal-line that he was able to bank off Alex Lyon for the opening strike. And Saarela scored his first marker of the evening on a breakaway shortly after Philip Samuelsson had almost converted on a deflection of a Steven Swavely pass. The Phantoms were close to cutting into the 2-0 margin in the second period and had early momentum in the middle frame but Mark Friedman was tagged for a holding infraction that was disputed by the Phantoms who felt Friedman was the one being held. Charlotte took advantage of the momentum from the call and scored shortly after the power play had expired following a blocked shot that felled Byron Froese. Saarela’s second of the game came on a rocket from just above the left circle to the stick side of Lyon for a 3-0 lead. Newcomer Stelio Mattheos (2nd) converted in just his sixth pro game after an extended push in the Phantoms zone. His shot eluded the right skate of Lyon and found the back of the net for a 4-0 margin after two periods. Mike McKenna entered in relief of Lyon for the start of the third period and the Phantoms again looked to generate some momentum. Froese blocked down a clearing try at the blue-line and connected with a cutting Aube-Kubel who blasted home his shot to the stick-side of Alex Nedeljkovic to put the Phantoms on the board at 4-1. Shortly thereafter came an impressive stretch-pass from Zach Palmquist locating Carsen Twarynski in the clear but his breakaway attempt was thwarted by Nedeljkovic. And then a pad-save would deny a Philip Samuelsson rocket from center-point against his former team. Julian Gautier (23rd) located a still-free puck at the side of the net that he was able to jam home at 9:08 into the third period to conclude the night’s scoring. Charlotte out shot the Phantoms 38-17. The Checkers were 1-for-3 on the power play while the Phantoms were 0-for-0. Lehigh Valley and Charlotte rematch Wednesday night at 7:00 p.m. The Phantoms return to PPL Center this Saturday at 7:05 p.m. and Sunday at 3:05 p.m. with back-to-back home games against the WIlkes-Barre/Scranton Penguins. 1st Period-1, Charlotte, Jurco 9 (Gauthier, Bean), 2:33 (PP). 2, Charlotte, Saarela 26 (Poturalski, Geekie), 14:46. Penalties-Palmquist Lv (hooking), 1:14. 2nd Period-3, Charlotte, Saarela 27 (Schilkey, Poturalski), 12:18. 4, Charlotte, Mattheos 2 (Carrick, Poturalski), 17:13. Penalties-Friedman Lv (holding), 10:02. 3rd Period-5, Lehigh Valley, Aube-Kubel 15 (Froese), 4:04. 6, Charlotte, Gauthier 23 (Renouf, Roy), 9:08. Penalties-Aube-Kubel Lv (roughing, roughing), 9:15; Froese Lv (roughing), 9:15; Samuelsson Lv (roughing), 9:15; Carrick Cha (roughing), 9:15; Jurco Cha (roughing), 9:15; Renouf Cha (roughing), 9:15; Bardreau Lv (slashing), 19:07; Lorentz Cha (unsportsmanlike conduct), 19:07. Shots on Goal-Lehigh Valley 3-6-8-17. Charlotte 19-9-10-38. Power Play Opportunities-Lehigh Valley 0 / 0; Charlotte 1 / 3. Goalies-Lehigh Valley, Lyon 16-15-3 (28 shots-24 saves); McKenna 7-7-0 (10 shots-9 saves). Charlotte, Nedeljkovic 32-8-5 (17 shots-16 saves). Referees-Mitch Dunning (43), Guillaume Labonte (35). Linesmen-Julien Fournier (73), Shane Gustafson (18). 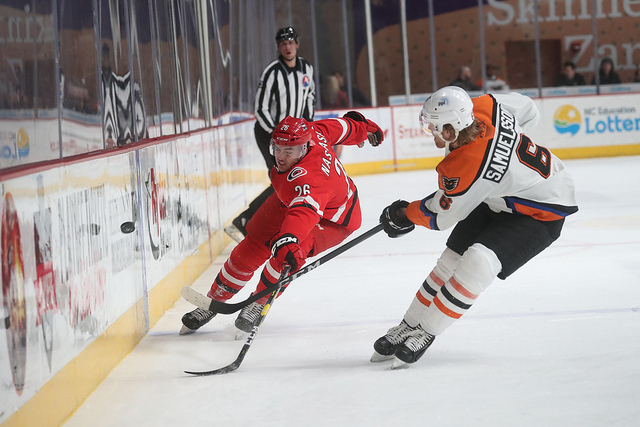 NEXT TIME OUT: The Lehigh Valley Phantoms conclude their five-game road-trip on Wednesday night at the Charlotte Checkers.